Tomi Juric came off the bench to take the Wanderers to second on the table. Tony Popovic made a remarkable nine changes from the midweek trip to Japan. Ante Covic and Shinji Ono were the only survivors, with the latter starting in what is possibly his final home match for the Wanderers. Jean Carlos Solorzano came into the Brisbane side for the first time since resigning for the club – his last start for the club was in the 2010 Grand Final against the Mariners. For the second time this season, these two sides played out a 1-1 draw, which was a fair reflection on the game’s overall pattern. The key feature of the first half was the pressing from both sides – very energetic, starting high up the pitch and preventing the other from settling into a rhythm. From a Wanderers point of view, the fact Brisbane couldn’t settle into their passing game would have been highly encouraging – Brendan Santalab and Shinji Ono prevented the centre-backs from having time on the ball, and there was a surprising amount of loose passes in deep positions, with Michael Theo even sloppily giving the ball away on a few occasions. It was similar to how they pressed in the previous fixture between these sides. Brisbane, though, were also preventing the Wanderers from playing, although this was less noticeable because their game is more direct, and they’re happy to bypass the midfield zone with longer balls towards the front four. However, with the midfield triangles matching up, it meant Luke Brattan could pick up Ono, and thus Liam Miller and Matt McKay could push up onto Aaron Mooy and Mateo Poljak – the latter two found it particularly hard to find space, and lots of the Wanderers build-up play was forced towards the full-backs. The first time Mooy was able to receive a pass facing forwards, it lead to the first real chance of the game. Mooy’s long diagonal found Mark Bridge, who played it back to D’Apuzzo – the full-back hit a probing low cross towards Santalab, whose flicked finish went just wide of the near post. Popovic rotates his side so often, and so dramatically, it’s become difficult to tell what’s a fitness-related change, or a tactical-based selection – so while Shannon Cole might have purely been in the side for the sake of rotation, it could also have been to protect Jerome Polenz against the dangerous Brisbane left flank, where Shane Stefanutto, Broich and McKay create neat triangles. Cole did a good job defensively here, tracking back to pick up Stefanutto, with Mooy dropping onto Broich when the German drifted inside. 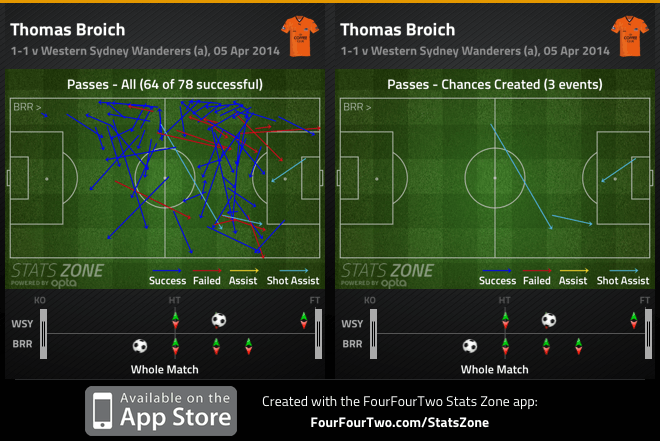 Aside from one particularly incisive piece of one-touch play that freed up McKay for a cross that was cleared behind, Brisbane didn’t get as much joy out of their left as they usually do – of course, Broich, McKay and Stefanutto were the game’s highest passers, but didn’t actually create much from left-sided positions. Going forward, Cole stayed wider than Youssouf Hersi does, so this limited Polenz’s overlapping runs. The right-back tended to come inside more, having a few shooting chances around the edge of the area, and also crossed a few times by cutting onto his left foot, with Santalab flashing one such cross just wide. It was possible Brisbane could’ve formatted their attack so that Broich was used centrally as a false nine, with two direct wingers – but Mulvey opted for Solorzano upfront, who tended to stay high up and try to run in behind. This wasn’t a huge problem because, as has been evident at times this season when Berisha drops off into midfield, Brisbane can be guilty of having too many players behind the ball – but because of the back-and-forth nature of the game, there were actually few opportunities for Solorzano to get on the end of through-balls. Instead, he was primarily attacking crosses, particularly from the right, as Brisbane gradually began to build long passing moves. Hingert hit a dangerous ball across the face of goal, then just before the goal, Petratos swung one in from a wide position. The goal itself came from McKay moving over to that side, and hitting an inswinging ball in. The deflection was fortunate for Miller, and it wasn’t a particularly prominent trend – but Brisbane had put in three dangerous balls from that side in the space of about five minutes, and so if they were going to score, it was going to come from a right-sided cross. Popovic turned to Tomi Juric at the break, withdrawing Cole and moving Santalab across to the right. Mulvey, meanwhile, was forced into bringing on Ivan Franjic with Hingert struggling with an ankle injury. Brisbane dominated the ball at the start of the half, and put the Wanderers under enormous pressure in the first ten minutes. However, the two times the home side bypassed the pressing high up the pitch, they had acres of space to move into in front of Brisbane’s defence – both times, Juric carrying the ball forward purposefully, although his end product was wasteful. On the hour mark, both sides again made changes – Popovic bringing on Appiah-Kubi for Santalab and Mulvey substituting Brattan for James Donachie, which saw Franjic move into the middle. Almost immediately afterwards, the Wanderers equalised with a fairly basic goal – Mooy attempting a long through-ball to Bridge that the winger somehow knocks back to Juric, who calmly places it in the far corner. This wasn’t particularly reflective of any overall pattern, though, but demonstrated the rather obvious concept that bringing on better players can make a difference – Juric is simply a better fit than Santalab upfront. He links up nicely with the players behind him, battles manfully for aerial balls and is a more composed finisher. Meanwhile, Brisbane found it much more difficult to control the game after Brattan’s substitution – Franjic was now the deepest midfielder but they didn’t seem as comfortable playing it out from the back through him, while they also lacked someone to protect the defence, with Ono getting a few chances to shoot from range on the edge of the box. Brattan’s defensive work is probably overlooked because of his contribution with the ball, but he does do an excellent job sweeping laterally across the width of the pitch to protect the defence, and Brisbane missed that quality in the final quarter of this game. The Wanderers looked particularly promising when they worked the ball out to Appiah-Kubi on the right – he hit a few dangerous crosses from wide positions, with Bridge narrowing from the other side and coming close on two separate occasions. 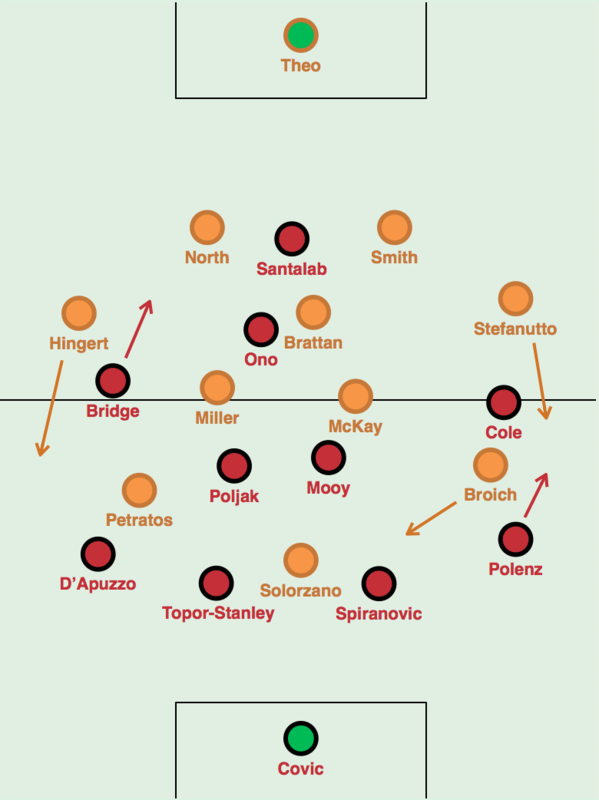 The key attacking threat for either side – Brisbane’s left, Western Sydney’s right – effectively cancelled each other out in the first half with Popovic’s use of Cole in front of Polenz. Brisbane started strongly in the second half with a combination of a high press and calm possession, but the Wanderers equalised somewhat against the run of play – and promptly dominated the rest of the match, partly because of momentum, and partly because Brisbane missed Brattan’s calming influence. Overall, though, this was an even game between, now, in terms of the table, the competition’s two top sides.